Tom Couch drives Collingwood into attack during the Magpies loss to the Casey Scorpions in round 11, 2011 at Casey Fields. Collingwood is pleased to announce the signing of former Melbourne midfielder Tom Couch to its VFL list for the next two seasons. Couch, 25, played three senior games in his two seasons on the Demons rookie list. He has previous experience in the Black and White stripes, having played 12 games for Collingwood’s VFL team under Tarkyn Lockyer in 2011. “Tom is an excellent addition to our VFL list,” VFL General Manager Luke Gatti said. “He provides grunt and leadership to our emerging midfield with Jack Hellier and Ben Moloney. “We think Tom will definitely enjoy being a par of the elite environment at the Westpac Centre and contributing to the development of AFL-listed players as well as VFL-listed players. It’s a case of back to the future for Couch who used his stint with the VFL Magpies in 2011 as a springboard onto Melbourne’s list. It was there that he caught the eye of then-Collingwood assistant coach Mark Neeld, who coached Couch for his first season and a half at Melbourne. “I really enjoyed 2011,” Couch told collingwoodfc.com.au. Couch said it was the way the club helped him deal with his mid-season bout of glandular fever that has stuck with him in the years since. “I played with that for 2-3 weeks mid-season before I went up to Queensland for a fortnight and pretty much did nothing. That was all with the support of the club. The 177cm on-baller is the son of Geelong Brownlow Medallist Paul Couch. Like his father, he has polled well in past competition best-and-fairest awards. He finished second in the 2012 J.J. Liston Trophy and took out the Casey Scorpions best-and-fairest in the same year. In 2013, he averaged 28.3 disposals in his 12 games for the Scorpions, seeing him ranked behind only James Magner of the Casey players to play more than one VFL game. No Casey player averaged more contested possessions than Couch (16.6 per game), while he ranked second at the club for clearances per game (7.2). “Over the last two years I improved a lot,” he reflected. “When I first got drafted I thought I was just going to be working on the basics, like improving my kicking, marking and handballing, but then I learned so much and it was just the little things I’ve picked up and added to my game with the extra fitness and what I’ve learnt to train at the level you need to play well at. Couch debuted for the Demons in round 16, 2012 against Fremantle and won 13 disposals. He played twice more before the season was out but did not feature at senior level this year. The challenges Melbourne has dealt with in the past two years have been well documented but it was an experience Couch says he will remember fondly. “The first six or nine months were just a buzz, to achieve my AFL dream and get drafted. To play NAB Cup and then to play in the AFL later in the year was surreal and still something I find hard to believe. I still pinch myself about it. “This year was difficult with injuries and a change of coach but I’m a better person and player for it. 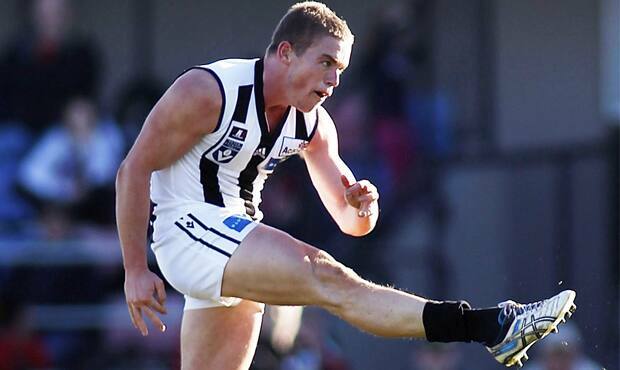 I’m really looking forward to playing well in 2014 with the Pies. I watched them closely this year and they’ve definitely improved and want to play finals in 2014. Now his focus turns to life as a VFL Magpie and while it was only two years ago that Couch last walked the corridors of the Westpac Centre, the newly renovated facilities are completely different to those he left behind in December 2011. “The facilities were good before but now they’re just unbelievable. They’re probably the best in Australia and unrivalled within the AFL.